Titmice, like this Tufted Titmouse found in eastern states, often frequent feeders with mixed seed. On the west coast, look out for the Oak Titmouse. Photo by Cindy Bryant via Birdshare. Sure, winter is a prime time for feeding birds—natural foods are less abundant and cold weather makes windowside birding that much more inviting. But birds flock to feeders in summer, too—especially in midsummer, after they’ve fledged a brood from their nest and they’ve got new mouths to feed. Summer bird feeding can bring you different species, such as Neotropical migrants that aren’t around in winter. It’s also a fun time to try offering some different kinds of foods. Here are some tips for creating a summertime backyard buffet that might bring a few new faces to your feeders. Attracting hummingbirds to your yard can be as easy as hanging a hummingbird feeder and filling it with a sugar water solution (1/4 cup sugar per cup of water). There’s no reason to add food coloring to turn the water red; you’re providing a substitute for flower nectar, which is clear. Don’t locate the feeder in direct sun, as the sugar water will spoil rapidly. In the shade your sugar water should last two or three days, except for very hot days, in which case it’s wise to change your hummingbird feeder water daily. Because mold readily grows in sugar water and can attach to feeders, make sure to take the feeder apart when cleaning. To clean your feeder, take it apart and use a dishwasher on a hot setting or hand wash either with soap and boiling water or with a dilute bleach solution (no more than 1 part bleach to 9 parts water), and rinse thoroughly. Why are hummingbird feeders red? It’s not because hummingbirds are inherently attracted to the color red, because these peripatetic featherweights feed on flowers of many colors: white, purple, yellow, red, even ultraviolet colors that we can’t see. But the key here lies in the eyesight of nectar-feeding insects, not hummingbirds. Bees, wasps, and butterflies are better at locating pale-colored flowers than red flowers. In nature, red flowers tend to have more nectar in them, because they aren’t being visited as often by insects. So hummingbirds are indeed attracted to red, not because they can see it better, but because they have learned from experience that red flowers tend to have more nectar than flowers of other colors. 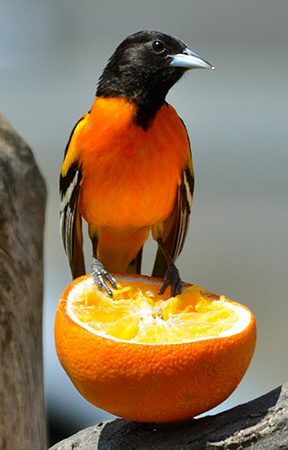 Orioles, like this Baltimore Oriole and their western cousins, the Bullock's Oriole, have a sweet tooth for fruit like oranges. Photo by Dave LaDore via Birdshare. 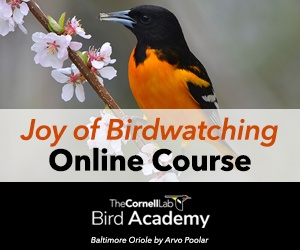 Flashy orange orioles are even simpler to lure in for backyard viewing pleasure. Just slice an orange in half and set it on a platform feeder or skewer it on your feeder pole. Other fruits will work too, such as cherries or grapes. Orioles seem to prefer dark fruit and will ignore yellow cherries or green grapes. They also LOVE grape jelly. Put a spoonful of jelly on your platform feeder, and once the orioles find it, it won’t last long! Why do orioles love fruit? It could be that they develop a sweet tooth while wintering in Central America, where they forage for a variety of wild fruits in tropical forests. Orioles sometimes use their slender beaks to feed in an unusual way, called gaping: they stab the closed bill into soft fruits, then open their mouths to cut a juicy swath from which they drink with their brushy-tipped tongues. Grosbeaks are one of the best reasons to keep your seed feeders stocked in summer. The males are handsome, decked out in black-and-white formal wear with a pop of color (a red chest patch for Rose-breasted Grosbeaks, warm cinnamon–orange bodies for Black-headed Grosbeaks). Females of both species are drab mottled brown and may be confused with finches or sparrows. Grosbeaks are seed-eating machines. They’ll eat millet but their favorite is good ol’ black-oil sunflower seeds. Why are grosbeak beaks so big? The better to eat large seeds with, my dear. Grosbeaks are one of the classic birds with beaks that indicate what they eat—big, sturdy beaks are best for crushing seed hulls. Those beaks are also mighty good at crushing insects and grasshoppers, another primary food source. A female grosbeak’s big beak is the first clue that you’re not looking at a finch or a sparrow, both of which have decidedly more petite beaks. Insectivores like bluebirds always welcome a mealworm snack. Here, an Eastern Bluebird grabs a bill full from a mealworm feeder. Photo by Lindell Dillon via Birdshare. Many people entice bluebirds to take up residence on their property by putting up nest boxes (also called birdhouses). If you have bluebirds in your neighborhood, you can get an up-close look at them by setting a few mealworms out on your platform feeder. 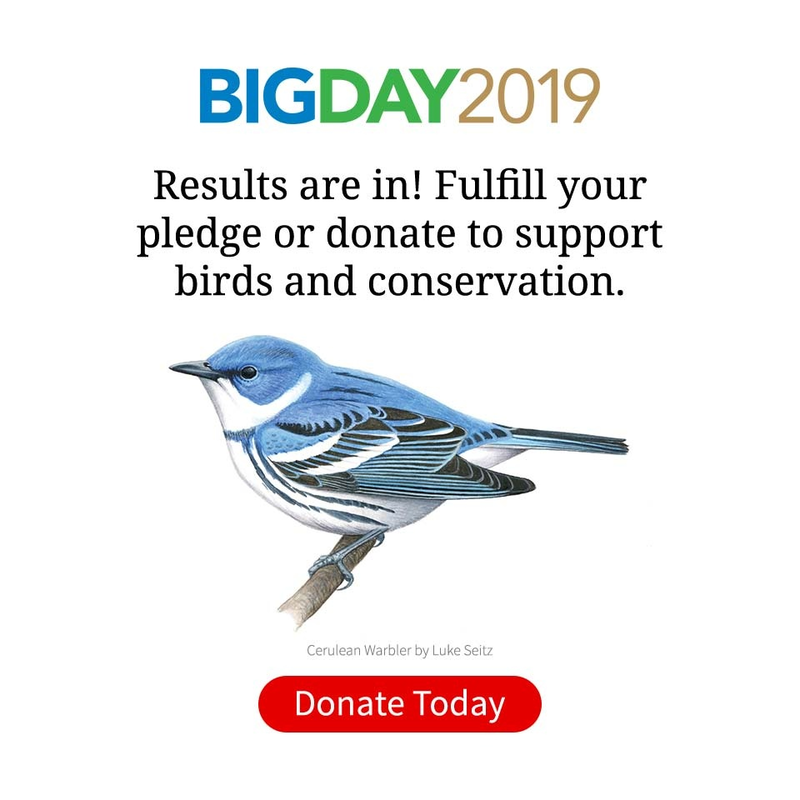 Bluebirds are insectivores, and an offering of a few mealworms—alive or dried—is a protein boost that’s hard to resist, especially during the energy-intensive breeding season. What to do with leftover fishing bait? If you fish with wax worms, set them out for bluebirds. Mealworms and wax worms are interchangeable for bluebirds, and some folks even say bluebirds will pick through a pile of mealworms to eat the wax worms first. Grosbeaks’ big beaks make short work of crushing seed hulls. Here, a Rose-breasted Grosbeak, found in eastern states, takes advantage of a feeder full of sunflower seed. In the west, look out for Black-headed Grosbeaks at your feeders. Photo by Robin Arnold via Birdshare. Dr. David Bonter has been studying feeder birds at the Cornell Lab of Ornithology for over a decade. In the course of his research, he fills and maintains more than a dozen bird feeders around Ithaca, New York. Here are his tips for safe bird feeding in summer. Keep your seed dry. Hot, humid summer weather creates the potential for mold. “Some molds produce the byproduct aflatoxin, which is fatal to birds,” Bonter says. He suggests filling feeders halfway in summer and refilling frequently, instead of packing feeders full so the seed sits for long periods. If you find mold on your seed, get rid of it. Move feeders occasionally. 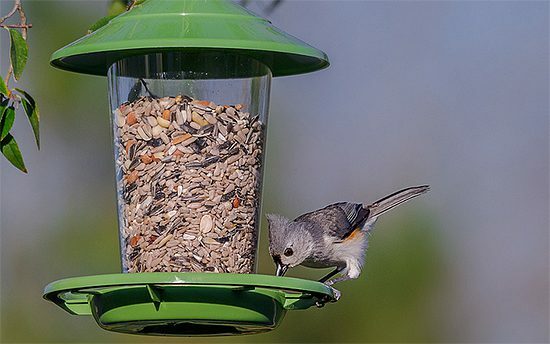 Concentrations of seed hulls and bird droppings under a feeder can lead to outbreaks of salmonellosis, a bacterial sickness that can affect birds (and people). Move feeders around the yard and don’t allow waste to build up in one area. Put suet in the shade. Some packaged suet comes in no-melt varieties, but even these can spoil or become soft and foul a bird’s feathers in high heat. Keep suet in cool places. Or, switch to a hummingbird feeder in summer. Clean your feeders regularly. Washing feeders roughly every two weeks will keep your feeders both attractive and healthy for your guests. To clean your feeder, take it apart and use a dishwasher on a hot setting or hand wash either with soap and boiling water or with a dilute bleach solution (no more than 1 part bleach to 9 parts water). Rinse thoroughly and allow to dry before refilling. Be bear aware. Black bear populations are on the rise in much of North America, and the big bruins will absolutely go after your seed stockpiles. Please be aware of potential bear problems in your area and if necessary, take your feeders down during summer to avoid unexpected bear visits. Should I take my feeder down when the weather starts to warm up?